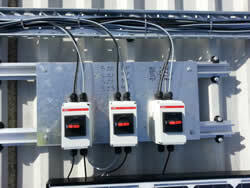 Solar PV (photovoltaic) technology converts daylight into electricity for use in buildings or exported into the Grid. 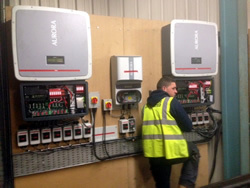 Our experienced, in-house solar teams design and install Solar PV systems for a wide range of commercial and large domestic customers including farmers, industrial units, offices, schools, leisure centres and multiple housing projects. Our experienced designers and installation engineers work to provide a professional service that fits around your needs as a business. Our service covers all aspects of the design, installation, testing, commissioning and maintenance. And we are always happy to take the time to talk through the options with you. As a local company we’re very responsive to your needs and time scales, and pride ourselves on providing quality products at competitive prices. We’re fully MCS certified and a member of the RECC assurance scheme, as well as winning multiple environmental awards across the business. Appointments for on-site consultations with a member of the A1 Solar UK Energy team can be booked through our commercial enquiry form. If you want to get a better idea of the type of installations A1 Solar UK provides then have a look at our case studies for Solar PV and Solar Thermal. 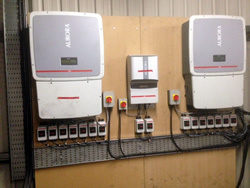 We install only proven, high efficiency, branded solar panels and inverters with a performance output that will maximise the 20-year investment returns of the Feed-in Tariff. Once your solar PV system is installed, our dedicated monitoring and maintenance department can help you keep your system’s performance on track. Call our technical experts today on 01889 578699 or send us an online enquiry to discuss your requirements in more detail. DECC has put in place a minimum energy efficiency requirement for anyone wanting to install solar panels on their building and claim the full FIT rate. 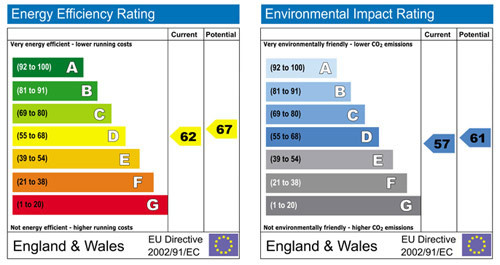 From 1 April 2012 properties are required to produce an Energy Performance Certificate (EPC) rating of ‘D’ or above to qualify for the full FIT rates. Exclusions include buildings not required to hold an EPC i.e. agricultural buildings without walls, schools and community buildings. An EPC is a certificate required for every house and commercial building that is rented or sold in the UK. It is performed by an energy assessor who visits the property and prepares the certificate. EPC surveys and certificates can be done by one of our registered Energy Assessors. An EPC Level D rating assumes a high level of efficiency in the building and is based on the property having some, or all of the following: condensing boiler, roof insulation, cavity wall insulation, double glazing, mains gas etc. Most properties built in the last 20 years will be at level D or close to level D.
What if my building is not Level D rated? 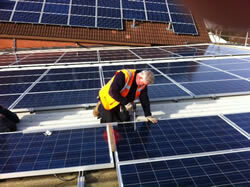 Buildings which are not level D will receive a lower feed in tariff. However, the government are considering giving customers time to upgrade their properties to reach level D, moving them to the higher tariff. Will Solar PV go towards my energy rating (EPC)? Yes, the Government has confirmed that Solar PV will count towards your EPC, however it is yet unclear to what extent, a standard domestic system is likely to add around 5 points, which would not be a significant increase in a property that is not very close already to a level D.
Commercial properties require EPC level D certificates if they are eligible for an EPC (ie tenanted buildings and those with heating controls). However, some properties will not require an EPC ie properties without walls, or heating or insulation, such as some agricultural buildings. We can arrange your EPC, the cost will be based on size of building. Please call us for a quote. What happens with community buildings? Community buildings such as schools are exempt from the EPC D requirement. Is an EPC Certificate useful? The certificate provides details of the current efficiency rating of the home being surveyed in terms of an Energy Performance Rating and an Environmental Impact Rating. Both ratings are measured on a scale from A to G with A being the highest attainable rating and G the lowest attainable rating. The certificate produced will contain recommendations based upon the results of a survey carried out on the property that will outline the potential for improvement in energy efficiency. A number of recommendations will be made detailing how this can be achieved. The completed certificate will be lodged in the Landmark database and will be made accessible to the person who commissioned the survey. You will need an EPC Certificate if you are selling the property. Our Energy Assessors will carry out your EPC prior to installation.